Here I was, sitting happily with all my November planned reading done and feeling smug on how well I cope with Reading Challenges and my TBR when God did an LOL and I read Jane’s post and I knew…well, I knew I would be a part of it, even before I read the details. 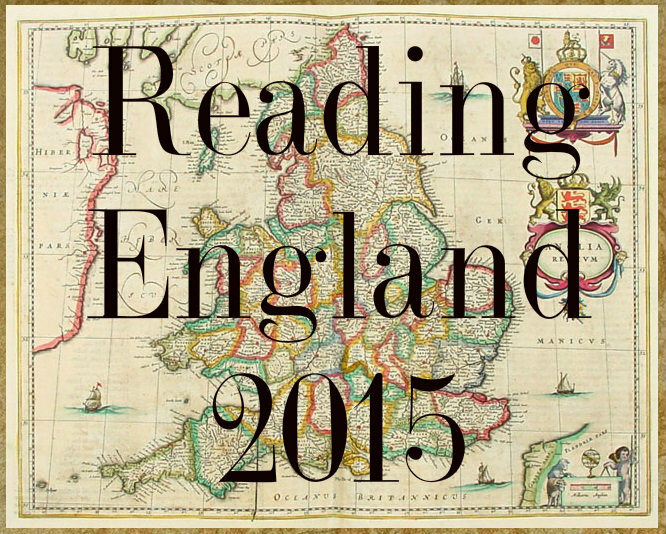 It’s called Reading England 2015 and was originally conceived by o at Behold the Stars! You can sign up any time between now and the end of 2015. Only books read after 1st January 2015 count, though. It would be grand if you blogged about the books you read for each county but you don’t have to. If you do, you don’t have to feel obliged to give any information about the county in general other than, maybe, “This is my review of x which is set in the county of x”. You could also include a description of the landscape in your posts, but again you don’t have to. Audio books, Kindles, and whatnot are accepted too. I have decided not be overambitious or give in to my intellectual greed in 2015 and therefore contend myself to Level Two 4-6 counties; if by chance I better it, well so much the better I guess. Now for the books – This is my plan, but not a concrete and cemented boundary line and therefore subject to change!! Here goes the list and here I go again…I never learn!!! But there is just sooooooo much to read!! P.S. I was planning to review “Picnic at Hanging Rocks by Joan Lindsey, but that will now have to wait!!! To begin with of course, I have the Women’s Classic Literature Reading Event and I am reading this hidden gem called “The Romance of a Shop” by Amy Levy. I owe Jane as usual an immense obligation in finding and sharing these lost books to the world! I am still struggling to complete my May and June books for the 12 Months Classic Challenge, but I am hoping to finish “Dombey and Sons” (My June Read) this week and then start Henrik Ibsen’s “The Dolls House” for July; the theme of the month being A European classic (non-British). For my Reading England Project which I have been overlooking for some time, I am reading “Cakes and Ale” by Somerset Maugham, covering the county of Kent. Finally I continue my “Jane Eyre“ by Charlotte Bronte Read Along with Cleo and Hamlette who is hosting the event. I also follow the monthly “Pickwick Paper“ by Charles Dickens Read Along hosted by O.
I realize this reading list looks kind of tame compared to my past lists; however, I seem to be straying again from the well trodden documented path and picking up books on the fly. I am breaking bad so to speak in my reading explorations, so to speak! Therefore it makes perfect sense for me to stick to basics, atleast for now and then pick up books as I like and what I chose , while balancing the progress of my this year’s reading goals! Finally as I close this post, I wanted to share that I will be hosting my first ever read along in August. Cleo, my partner in all reading adventures has promised to join and I am hoping some of you will also join both of us as we read Rabindranath Tagore’s masterpiece “Home and the World“. One of the most intriguing and bold pieces of literature to come out of India in 19th century, it remains a resounding classic about human fallacies and courage. I will be sharing details of the reading plan as well some historical context for the novel, so that we may enjoy it to the best in the upcoming weeks! I hope many of you will join us as we explore one of the best works of Eastern literature! I am seeing many posts around the internet, celebrating Summer! Reading and Summer seems a most conducive combination; reminds of my summer vacation from schools, with 2 and a half month of bliss, reading and eating! Unfortunately, as a Project Leader, I do not get summer vacations and more importantly, the concept of an idyllic summer with bright, cheerful days and quite balmy nights is dispelled in my part of the word and instead replaced by unceasing, pounding heat, that makes one feel like one is being slowly baked in one’s skin in the very middle of a vast furnace, with the earth and the sun belching out fire! Temperatures have hit 51ºC or 123º F and there is no respite in sight….monsoons when they come, if they come, will be hailed as Godsend by most, especially the farmers of this country, struggling with heat and drought! Realities are harsh and books as usual provide a consolation from all that is mundane and distressing! Therefore without further ado, lets plunge into June Bookish Plans! As most are aware, for May, I had dispelled all reading plans because I had tremendous catching up to do; thankfully, I am almost caught up with all, but there are still some items that need to be finished, but hopefully should finish soon! I venture towards June again finally with a reading plan! My Read Alongs continue on track as planned – I am hoping to finish the Lord of the Rings by J. R. R. Tolkien Read Along with Cleo as I had planned in June. I should also make some progress in the ever challenging The Faerie Queene by Edmund Spenser which I am reading with O, Cleo, Jean, Ruth and some other readers; I am going really slow with this one as it takes up quite a bit of time to truly understand and absorb the various levels of intellectual gymnastics that Mr. Spenser had laid out for his readers! The Pickwick Papers by Charles Dickens read along is also in the plans and its an effort to really read it in piecemeal fashion, considering I am enjoying it tremendously! I have added another to my overspilleth list with Hamlette’s Jane Eyre Read Along. I have increasingly developed a great love for Jane Eyre by Charlotte Bronte and the cold of England is very bracing psychologically, sitting in the stewing pot! Among the reading challenges, where I am really truly behind is my 12 Month Classics Reading Challenge – I am still to finish Arrowsmith by Sinclair Lewis for May and I have for June themed A British classic, Dombay and Son’s by Charles Dickens. I am also somewhat struggling to catch up on my Reading England project, and for this I am reading The Darling Buds of May by by H. E. Bates covering Kent. Finally for my Women’s Classic Literature Event, I am reading a modern and albeit a relatively lesser known classic by Katherine Ann Porter – Ship of Fools. In a stand alone event, I am also reading The Ladies of Lyndon by Margaret Kennedy as part of Margaret Kennedy Day hosted by Jane, who had two years ago introduced me to brilliance of Margaret Kennedy’s works! That is all I have planned for June; like I said I have had to play catch up and am still struggling to complete everything that is outstanding. This is also the first time I am giving the Classic Club spin a miss – I have yet to finish Death comes to Archbishop by Willa Cather which was my last Spin Read and also my Women’s Literature Reading Event for April and it is only fair that I venture into another Spin only after I had finished the previous one! That’s the plan then! Wishing you all a fabulous and less heat generating summer and a scintillating brilliant reading time! For now however, April is here and considering the amount of reading I am taking on each month, I have started maintaining a Reading Journal, just so I remember what I have to read and how much I have to read and how many books at a glance are in my TBR, atleast the ones on Kindle! Just so I start getting some more discipline in not only my reading but also my book buying spree. I am not sure if this will work, but I will keep you all posted! Now, considering I was on holiday during a significant holiday portion of March, I manage to stick to reading plan pretty well, except I did not read the fictions that I had charted out including Up the Country by Emily Eden, The Clan of the Cave Bear by Jean M. Auel and The Best of Everything by Rona Jaffe, because I was busy reading about Tibet! Since I was planning to do some serious cultural exploration of the Tibetan lives during my vacation, it made sense to read up some stuff but I may have gone on an overdrive! But now I know much more beyond the Chinese annexation of 1951 and, for a somber moment, it is not a happy thought that a culture is passing away and hundred of Tibetans are dying with it while the world looks on! I will re-visit this later for sure! For the April reading, there is an urgent need like I mentioned to discipline and close on everything that I already have and finish the open tasks! I am yet to complete my March Play, The Man Born to be King by Dorothy Sayers and since I did not want to add on more complications, I decided to mix my Drama Reading for April with my Reading England effort, this time covering Warwickshire and am going to read As You Like It by the Great Bard of England, William Shakespeare. Again because I have couple of books stemming from March, I decided to roll in Classic Club Spin#12 and Women’s Classical Literature Reading Event for the month and read Death Comes to the Archbishop by Willa Cather. The April theme for 12 month Reading Challenge is “A classic you’ve seen the movie/miniseries/TV show of” and I read The Murders at Rue Morgue by Edgar Allen Poe. I have seen the 1983 made for television film recently and I was not very impressed, but I will read the book with an open mind and then decide on the matter! Finally, Ali is holding a Mary Hocking Reading Event and as both she and Jane have words of high praise about Mary Hocking’s works and since I really really appreciate their insights, which has led me to reading some brilliant works, I will for sure join this one reading event – Good Daughters by Mary Hocking! My serial readings continue as before – I continue to read The Lord of the Rings by J. R. R. Tolkien with Cleo as part of my Lecito List and have now moved to The Twin Towers. I also hope to finish Metamorphoses by Ovid; I am down to the last two books and I really need to complete it before I move on to what I consider my reading albatross. For the next couple of months I will be reading The Faerie Queene by Edmund Spenser with Cleo, O, Ruth and many others . I read TFQ in college and did not like it at all. But I am hoping for a better experience this time, but for now I see it as an albatross! On the brighter side of things, I continue with the Pickwick Paper by Charles Dickens Read Along and I am beginning to really enjoy the work as well the way we are reading it! Finally Cleo again leads me into all these reading temptations and I have surrounded to them (completely my choice and my will) after a long fight (actually no fight at all!) with them – I am reading The Histories by Herodotus as well as 1 poetry a week for the National Poetry Month! I know I need therapy! I wonder if there some kind of recovery program for the book reading obsessed! Do let me know if you find one….until then I am off to read! After much wringing of hand and utter confusion and mental distress, I plodded forth to read Frenchman’s Creek by Daphne Du Maurier as part of my Reading England project, focusing on Cornwall. As many are already aware, I had no patience with Rebecca and completely lost my sanity with Jamaica Inn, why then would I venture to another Du Maurier? What can I say, except I was hoping for third time lucky??!! Not the best logic, but considering there is a huge reading population that swear by Du Maurier, I really really wanted to give her another chance before I shut the door completely, hence the Frenchman’s Creek adventure. The book is set in Restoration England, and at the very onset, we are introduced to Dona, Lady St. Columb, who has made a hasty departure from the decadent London Court of Charles II and is heading for her husband’s Cornish country estate of Navron with her children. Dona who has been married for six years, has adapted to the life of Charles II court of being vacuousness and frivolity without really ever belonging to it. After an attempted practical joke on a old Countess, that jars Dona to reality, she heads to Navron, seeking peace and trying to find her true self, away from the bustle of London and her clumsy husband Harry. In Navron, she soon discovers, that the county has been pillaged by attacks from a French pirate and Dona soon learns that Navron which overlooks the creek that flows into the ocean is used by the French pirate as a hideaway. Her exploration of the creek soon brings her in contact with the great Pirate himself and Dona seeking adventure, soon becoming friends and then falls in love with him. She finally agrees to go on piracy expedition with him against one of her neighbor’s vessels. The attack is a success and Dona promises to return to the pirate after she has met her children; however once she is back in Navron, she discovers that Harry and his detestable friend, Rockingham are back with some serious designs of harming the pirate and Dona has very little time to decide on actions that will determine the pirate’s as well as her fate! Restoration England, Cornwall and Pirates, how bad can the book be? Guess again! It was TERRIBLE! No third time lucky for me. The characters are all ridiculous and unbelievable.Lets start with Dona, she is beautiful and she is bold. That’s the beginning and end of her. She married a man of her choice and them she found him clumsy, though through the novel I could figure out that Harry, albeit clumsy was devoted to Dona. She finds the life of London shallow., after indulging in all manners of shenanigans for six years. She finds Rockingham impertinent, after she allowed him to flirt with her and kiss her. I mean this woman does everything she wants, without thought or deliberation and when the results are not to her liking, she claims boredom and dissatisfaction. The way she treats Harry is disgraceful; she orders him about, never giving him any explanation of her conduct, behaving in a illogical autocratic manner through the novel. In my opinion, Harry should have left her to begin with. Then we have our Frenchman, who is a rich, aristocrat who indulges in Piracy because of boredom. Arrrrgggghhhh! What is it with this boredom??? Is there no better way to kill it than doing something criminal.The justification Ms. Maurier is quick to point out is that the Frenchman only robbed the rich. I may have lost my common sense here, but being rich is not a crime for which you have to pay through the actions of a Robin Hoodsque character. However stealing last I checked was a crime, regardless whom you steel from! The remaining cast and crew are nothing to write about, there is the cliched loyal servant and the classic evil villain and the goofy nobleman. At least in Jamaica Inn, there was some brilliant and torrid description of the land and climate, that set the stage for the adventure; the language in this book is just placid; it hardly changes or moves, except for one reddening storm, which came and went! There is no originality in the plot nor is there any real thrill and I kept going simply because I wanted to finish what I had started, as a form a self torture for picking up another Du Maurier. I know I have sworn this before, but I am truly never ever reading any Du Maurier again! She is completely unbearable. A complete waste of time! P.S. As I look back on my review of Jamaica Inn, O had warned me that this was a bad book and I had said I would not even venture near it and then I clean FORGOT!! Next time as an act of kindness if you see me attempting another Du Maurier, just point me towards Jamaica Inn review and then this one! I finished reading Emma by Jane Austen over the weekend. It was part of a Read Along hosted by Sarah Emsley and Dolce Bellze’s and it fitted very nicely into my Women’s Classic Literature Event. Also while I was reading it, I realized it could also be part of my Reading England project with its coverage of Southern England and Surrey to be specific. This is why I worship Jane Austen; she always complies with all my needs! I was supposed to read it through the month of December, but greedy me, just could not let it off! Emma begins with a description of our primary protagonist, Ms. Emma Woodhouse of Hartfield, Highbury. She is beautiful 21 years old heiress of 30,000 pounds a year, beloved daughter to a doting father and mistress of his house. She has everything going her way, financially secure, loved by all, life is as perfect as it can be. Her sister Isabella, senior to her by 7 years is married to Mr. John Knightly who is a barrister in London. His elder brother is Mr. Knightly, a friend and neighbor to Hartfield; he owns the huge acres associated to Donwell Abbey and is the primary landowner and Justice of Peace of the area. He is also one of the few people who can see faults of behavior with Emma. The novels opens with the marriage of Miss Taylor, former governess and then best friend and companion to Emma with Mr. Weston. Mr. Weston is a self-made man, who had suffered some misfortune in his first marriage to the very rich Miss Chruchill, who had died in the fourth year of their marriage, leaving him with a young son. This son, Mr. Frank Chruchill was brought by Mr. and Mrs. Chruchill (brother and sister-in-law) to Miss Chruchill and considered the heir to their vast estate. Therefore Mr. Weston free of all responsibilities had worked had, built a fortune, bought Randalls and finally married Miss Taylor. Emma believes that this marriage happened through her efforts and match making skills and this un-parallel success, convinces her to continue matchmaking among her friends, like Miss Harriet Smith, a parlor border at the local school, whose parentage is unknown and Mr. Elton the local vicar, with amusing and sometime disastrous results, finally leading to mature realization in Emma of what truly constitutes marriage, love and companionship. What more can I say about the inimitable Ms. Austen and her work – except, Vi! Va! Ms. Austen! I know I have been away, but this time it was a good away. I was on road trip with bunch of friends visiting one of the most underrated ruins of medieval world, Vijaynagar. I will post up a bunch of pictures about this wonderful city in ruins soon with a bit of history (dependent on when my flatmate downloads the pictures from her camera!) In the meanwhile, December is here; my favorite month ….the birthday month, the holiday season month, the off with old and one with the new month! I celebrate it, naturally with books and more books. To begin with, as part of my Women’s Classic Literature Reading Event as well as my Reading England Project, I have started reading Elizabeth Barrett Browning’s Aurora Leigh. Jane had blogged about it way back and since then it has been on my TBR forever. I am LOVING the poem so far! I have also decided to join Sarah Emsley and Dolce Bellze’s Emma Readlong, celebrating the 200 years of publication of Emma by Jane Austen. Being December, I have naturally overloaded myself with more books than I can possibly read – I am almost done with third Cormoran Strike Novel; this volume is just something else and there is too much of harsh reality to absorb, but I just cannot seem to stop. I have also began Kazuo Ishiguro’sThe Buried Giant, and, well I will review it pretty soon. I also have Azar Nafisi’s Republic of Imagination lined up, but I am not sure if I will be able to finish it this year. I also bought Anita Desai’s Baumgartner’s Bombay on a whim and I plan to finish this volume soon. Finally, I realized that while I was reading extensively in English, I have not read much, especially in recent years in my native languages of Hindi and Bengali. There is a vast pool of literature that is available in both the languages and some of most beautiful prose ever written is in Bengali. Therefore, it is but natural that I begin re-reading some works in this language and towards this end, I also started reading “Kitne Pakistan” (literally meaning How many Pakistans) by Kamaleshwar – it is a courtroom drama where historical figures are bought in to be tried to understand why was India partitioned in 1947. It’s quite a gripping read so far. Monday morning, they will announce a number from 1-20. Go to the list of twenty books you posted, and select the book that corresponds to the number we announce. The challenge is to read that book by December/January, even if it’s an icky one you dread reading! Now I wait with bated breath for Monday to arrive! To end, as you can all see, I have changed my blog pages a bit as some things were really not working out, while I was racing in others. I thought, it best to go with the flow and therefore took off The Poetry Project and the A Century of Books and instead replaced them with Reading England and Women’s Classic Literature Event. In the near future sometime, I hope to get back to both these abandoned projects and then may re-open these pages. That all for tonight folks! Happy Reading! I finally managed to get through another classic as part of the Reading England event in which I am participating. I extremely pleased that I had planned on reading this book in May and after many months I have adhered to my reading plan. After several months of stop/start, it is good to finish some books that I have wanted to read and have not been able to for various reasons! Anyway, moving on, let’s get down to the book – it is Howard’s End by E.M. Forster. The only EM Forster book I had read was (Sigh! Naturally!) The Passage to India; I read it when I was 17 and did not like it one bit and considered it pretentious. But at my advanced age of 33 I have realized that it does not help to hang to all opinions formulated as a teenager and some experience shows have been proved quite wrong! Therefore I was moderately open to reading another work by EM Forester and ventured boldly forward and plunged myself into Howard’s End. The book is set in Edwardian England of 1910 and follows the lives and experience of the Schlegel sisters – Margaret and Helen. Brought up in an atmosphere of art and literature with financial independence, the two sisters have surrounded themselves with a music, literature, theater, travel etc and live at Wickham Place in London with their younger brother Tilby. The rhythm of their lives undergo a change when Helen, the younger sister visits the Wilcox family, who, the Schlegels had met during a trip to Germany and are invited by Mrs Wilcox to visit them at Howard’s End and enters into a hasty engagement with the younger son, Paul. Though the engagement is broken off the same day, it puts the two families on uncomfortable grounds; however honest sincere friendship between Mrs. Wilcox and Margret that began from the trip in Germany and continued despite the broken engagement, help cement relations and sustain even after Mrs. Wilcox’s death. Mr. Wilcox soon starts socializing with the Schlegel sisters and basis an insider tip, they convince an acquaintance of theirs Leonard Bast, a young clerk who aspires for better things, to leave his position in an insurance company and seek employment elsewhere, since Mr. Wilcox is convinced that the insurance company is going to be dissolved. Mr. Wilcox and Margaret soon develop a healthy respect for each other which turns to love and they decide to get married. Helen does not like Mr. Wilcox, considering him materialistic, and especially after it turned out that Leonard Bast who had left his insurance company of the advice of the sisters had lost his new job due to retrenchment and the Insurance company was not going to be dissolved; and is aggrieved by the fact that her sister is marrying him, despite knowing the kind of harm Mr. Wilcox did to Mr.Bast. Despite Helen’s staunch dislike, the wedding date is is set for September, after Evie, Mr. Wilcox’s daughter is married. However on the eve of Evie’s wedding, series of events are set rolling by Helen that would change the lives of Wilcoxs and Schlegels forever, bending and breaking relations and forging truths that come back from actions in the past for everyone to dwell on! What can I say about the book except that I was stumped! I was mesmerized and all the while reading the book, there were so many instance of “Hey! That is so true!” EM Forster had written an extremely intelligent, sensitive and intuitive book. The book that forces the reader to see the apparent truth and succinctly point out, what most of us ignore or choose to not really give attention to because, while obvious, it is also uncomfortable! Like -“I believe we shall come to care about people less and less, Helen. The more people one knows the easier it becomes to replace them. It’s one of the curses of London. I quite expect to end my life caring most for a place.” Or Culture had worked in her own case, but during the last few weeks she had doubted whether it humanized the majority, so wide and so widening is the gulf that stretches between the natural and the philosophic man, so many the good chaps who are wrecked in trying to cross it. The plot beautifully brings out the two ends of the Edwardian society – The Wilcoxes – hardworking, intelligent folks who get things done and the intellectuals Schlegels who represent all that intransient and intangible – art, music and books! Despite all the “material’ considerations of Wilcoxes, Foster shows them is a very positive light as a class of people because of whom countries become nations and nations empire. “If Wilcoxes hadn’t worked and died in England for thousands of years, you and I couldn’t sit here without having our throats cut. There would be no trains, no ships to carry us literary people about in, no fields even. Just savagery. No–perhaps not even that. Without their spirit life might never have moved out of protoplasm. More and more do I refuse to draw my income and sneer at those who guarantee it!” The characters are wonderfully woven and even when they fall, they redeem themselves by some other act of kindness. In Margaret Schlegel especially, Forster created one of the most brilliant heroines of all times – she is intelligent, intuitive, with bottomless capacity to understand and guide human behavior, forgiving and generous with a body of solid morals, capable of standing alone against the world when need be! Forster through the character of Margaret Schlegel comes out blazing in support of women emancipation and their right to be treated as equals. Finally, I cannot help but feel that this book is an Forster’s ode to England – England and its natural beauty is described and referred to all through the book , in all its glory and beauty. It’s a wonderful book and I am so glad to have read it….its filled with such wonderful instinctive truths that I had more underlines in this book, than any that I have lately! I could share all of them with you, but I rather you read it holistically to grasp the wonderful brilliance of this book!